4 Celli. The famous one! There are several arrangements of this piece; mine endeavors to keep all parts equal, where everybody gets the tune. Few notes above fourth position, parts are halfway between easy and intermediate, more difficult musically than technically. A video recording of an earlier, higher, more difficult version of this arrangement, Played by the Boston Cello Quartet on Youtube. and included in their CD "Pictures" . 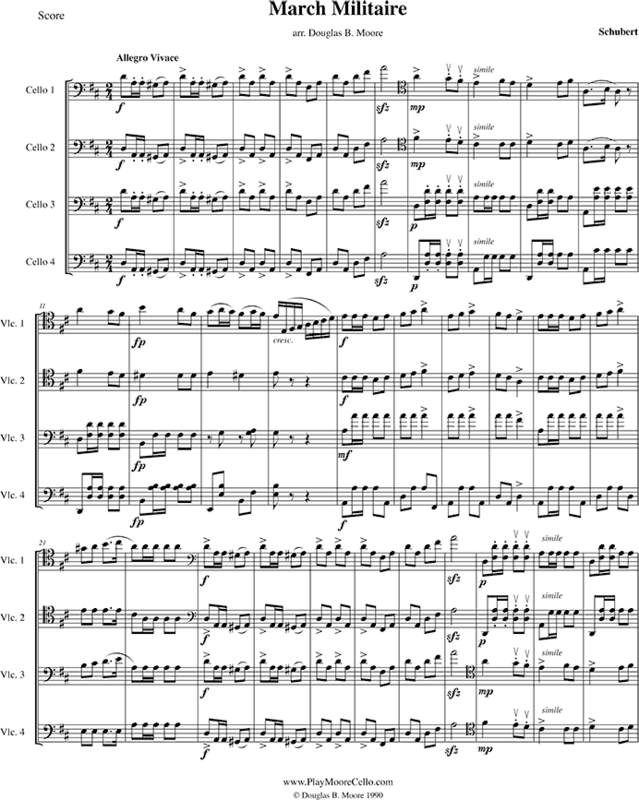 This is a downloadable arrangement. Buy it now and you can download the PDF directly to your computer. To receive printed folio copies (extra charge for postage), ask for them in the comments section of the order. Copyright 2009-2019 - Douglas B.. Moore and Wave's End Services, LLC. 4416 Red Fox Ct, Loveland, CO 80537.